The families into which children are born, and in which they spend the early part of childhood, have changed dramatically over the past several decades. Among the most notable changes is an increase in nonmarital childbearing—that is, the percentage of all children born to unmarried parents. Recent estimates show that about 40 percent of births in the United States occur outside of marriage, up from 28 percent in 1990 (Child Trends, 2016). This increase is consistent with changes in nonmarital childbearing seen worldwide (Chamie, 2017). New analyses by Child Trends indicate that the likelihood that a child will be born to unmarried parents varies substantially by the mother’s current education level and by her race and ethnicity. In 2016, 28 percent of all births to non-Hispanic white women (i.e., white) occurred outside of marriage, a figure that is almost twice as high as the 15 percent of births among this demographic that were nonmarital in 1990. In 2016, 52 percent of all births to Hispanic women occurred outside of marriage, up from 34 percent in 1990 (a more than 50 percent increase). The percent of births that occurred outside of marriage also increased for non-Hispanic black women (black) between 1990 and 2016, from 63 to 69 percent (a nine percent increase), though a much lesser extent than for white and Hispanic women. Between 1990 and 2016, the percentage of nonmarital births rose substantially across all levels of education—albeit somewhat less so for parents with the fewest years of education. The greatest increase in nonmarital births was to women who attended some college or earned an associate’s degree (but did not earn a bachelor’s degree); the percentage of nonmarital births to these women more than doubled, from 17 percent in 1990 to 43 percent in 2016. The percentage of births to unmarried women who completed high school or earned a GED (but did not go to college), and to those with a bachelor’s degree or higher, doubled from 1990 to 2016. Although women who did not finish high school also saw increases in nonmarital childbearing, those increases were not as dramatic (46 percent in 1990 and 62 percent in 2016). Despite these changes, the difference in nonmarital childbearing between women with the lowest and highest levels of education remains substantial. 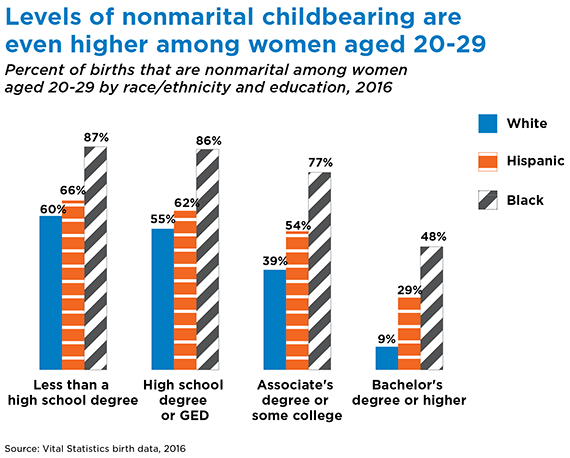 In 2016, births to women who did not finish high school or obtain a GED were more than six times as likely to be nonmarital (62 percent) as births to women with a bachelor’s degree or more (10 percent). The relationship between education and nonmarital childbearing varies by race and Hispanic ethnicity. Notably, the difference in nonmarital childbearing between women with the lowest levels of education and those with the most education is largest among white women. In 2016, 59 percent of births to white women who did not finish high school or obtain a GED occurred outside of marriage, which is almost nine times higher than the 7 percent of births to white women with at least a bachelor’s degree. The comparable gap is roughly 2.5 times for black women (82% compared to 33%) and roughly 3 times for Hispanic women (61% compared to 20%). Even within the highest education category, there are still large racial/ethnic differences in nonmarital births. Although only 7 percent of births to white women with a bachelor’s degree or higher occur outside of marriage, one in three births to black women (33%) and one in five to Hispanic women (20%) with the same level of education were nonmarital in 2016. Among women ages 20 to 29—who are more likely than older women to be new parents—levels of nonmarital childbearing are even higher than for all women ages 18 and older, across education and race/ethnicity. This is particularly true at the highest levels of education. For example, almost half (48 percent) of births to black women ages 20–29 with a bachelor’s degree or higher are nonmarital, compared to one-third (33%) of births to all black women ages 18 and older with a bachelor’s degree or higher (see Table 1). These patterns suggest that we are unlikely to see a reversal in nonmarital childbearing anytime soon. Many explanations have been offered for the increase in nonmarital childbearing. Most immediately, the percentage of births that occur outside of marriage is determined by three factors: 1) the proportion of women who are married, 2) the fertility rate of married women, and 3) the fertility rate of unmarried women. A change in any of these three factors can lead to an overall change in the percent of births that are nonmarital. Additionally, differences between groups of women, either by race/ethnicity or education (or both), across these factors can contribute to overall group differences in nonmarital births. One of the most notable changes in recent decades has been in the first factor: the proportion of women who are married. Women and men are marrying at increasingly older ages, on average (U.S. Census Bureau, 2017). Women’s median age at marriage was 27.4 years in 2016, up from 23.9 in 1990. This means that relatively fewer women are married when women are most likely to have a child. Additionally, fewer adults are getting married. This is particularly true for blacks and Hispanics, who have seen the most dramatic declines in marriage rates (Wang & Parker, 2014). In 2012, 35 percent of black adults and 26 percent of Hispanic adults (ages 25 and older) have never been married, compared to 16 percent of white adults. Declines in marriage have been linked to a range of social and economic factors (Solomon-Fears, 2014). Increasingly, couples are waiting for economic security or stability before getting married. In this domain, nonwhites are especially disadvantaged. These economic disparities reflect, to some extent, the lasting effects of institutional and systemic racism that surface in inequitable policies, practices, and social norms. For example, given the strong tendency for people to marry same-race partners, the comparatively high levels of unemployment, underemployment, and incarceration among black men may limit the opportunity of black women to marry (Raley et al., 2015). Additionally, black women outnumber black men among the most highly educated populations, further limiting marriage opportunities and increasing the likelihood that births will occur outside of marriage (Reeves & Guyot, 2017). This may be one explanation for why one-third of births to highly educated black women (and almost half of births to highly educated black women in their twenties) are nonmarital. At the same time, however, cohabitation has increased. Notably, many nonmarital births occur to couples who live together in a cohabiting union but are not formally married. Recent estimates suggest that 62 percent of births to never-married women are to women in a cohabiting union (Lamidi, 2016). However, white and Hispanic women are much more likely to have a birth in the context of a cohabiting union than black women (Payne et al., 2012). Although many children born outside of marriage will thrive, research shows that they are more likely than those born to married parents to be poor, experience multiple changes in family living arrangements as they grow up, and face cognitive and behavioral challenges such as aggression and depression (Child Trends, 2016). While cohabiting parents are more likely to marry after the birth of their child than parents who don’t live together, cohabiting unions are generally less stable than marriages and put children at increased risk for adverse outcomes (Osborne, 2005; Manning, 2015). Recent federal efforts have encouraged marriage among low-income unmarried couples through relationship education and the provision of critical support services (Office of Planning, Research & Evaluation, n.d.). However, not all couples who have children outside of marriage will be able to marry or want to marry. Despite this, positive parental involvement with a child is linked to better child outcomes, even when the parent does not live with the child (Scott et al., 2016). To promote well-being among the many children born outside of marriage, policymakers and program providers should encourage and support healthy relationships between unmarried parents, regardless of whether they share a household. In addition, efforts should continue to help all couples avoid unplanned pregnancies. Child Trends used National Vital Statistics System (NVSS) birth data from 1990 and 2016 to conduct analyses for this brief. The NVSS data include all birth certificates from live births filed in all states and the District of Columbia. For analyses of education by race and Hispanic ethnicity, we limited our sample to women whose race/ethnicity is listed as non-Hispanic white, non-Hispanic black, or Hispanic. For all analyses by education level in this brief, births are excluded from our analytic sample if the mother’s educational status is “unknown/not on certificate” or “excluded.” The first figure includes all births, even if the mother’s race/ethnicity or education level information is missing. Our sample of births to all women ages 18 and older included n=3,671,456 births in 1990 and n=3,838,160 births in 2016. Note that, in these data, parents’ education level is assessed at the time of the child’s birth. Young women (especially those younger than age 22) may not yet have had a chance to complete college, although they may do so eventually. As a result, the youngest women in our analyses are concentrated in the lower educational categories. For 2016, NVSS “bridged race” categories are used to make comparisons to the categories used in 1990. The 31 race categories specified in the 1997 Office of Management and Budget (OMB) standards for the collection of data on race and ethnicity are bridged to the four race categories specified in the 1977 OMB standards. The 2016 educational attainment categories are eighth grade or less, ninth through twelfth grade with no diploma, high school graduate or GED completed, some college credit but not a degree, associate’s degree, bachelor’s degree, master’s degree, doctorate or professional degree, unknown/not on certificate, and excluded.